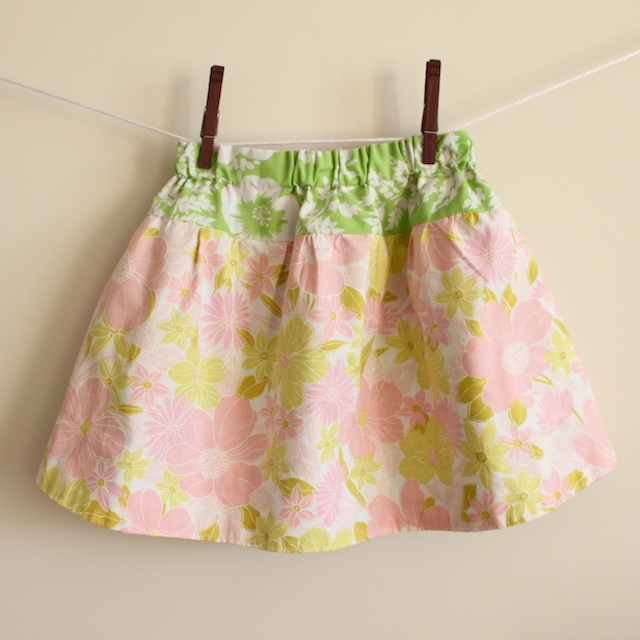 This is the skirt pattern that I created to use with the reversible skirt tutorial. But you can use this to create a simple skirt pattern for yourself. There is going to be a little bit of math to figure out for the skirt pattern. To draw the pattern, you are actually only going to draw a 4th of the whole skirt. The measurements include a 1/2 inch seam allowance. If you make something using this tutorial, please upload pictures of it in our Flickr group to show it off to everyone. You may be featured on Simply Modern Mom. 1. Measure the waist circumference and desired length of the skirt. Or grab a favorite skirt and use measurements from that. 2. The math equations for the different parts of the pattern are below. Look at the diagram to see where it is on the skirt. 3. Once you have your measurements, use scrap fabric or butcher paper to draw your pattern with the measurements. 4. When you are tracing the pattern piece onto your fabric, match the straight edge on the right side of the pattern to the fold of the fabric. You will need 2 of those pieces to make a whole skirt. 5. In the case of the reversible skirt, I cut at the dotted line below to make 2 separate skirt pieces and the top piece had a different fabric pattern than the bottom piece. » Tell me… Is this pattern simple enough to understand? Have you drafted your own skirt pattern before? How did you do it? For more skirt tutorials from skirt week, click on the skirt week logo below and scroll down on the new page. This is great thanks. I found a skirt drafting tutorial online and thought it was too complicated to understand. I keep searching and found a much easier on, but it didn’t call for the rounded bottom. So the skirt I made looks great off, but the seams hang down lower than the front and back. like a sad face. Thanks for sharing! I am going to try this today. I am a fairly new seamstress, but have never found a great tute for making a skirt pattern. I think this is great, I will let you know how it turns out! I followed this pattern. I am a novice in the sewing realm, for the most part. Maybe you should include a formula for finding the arc of the rounded edge. I ended up with two pointy sides to my skirt (because I guessed and free-handed what the rounded edge should be). I plan to gather the sides (and get creative with it), but if I weren’t so crafty, I’d be pretty bummed out right now. Ugh! I tried this this morning & my machine is all goofed up & broken now…grrrrr….!? Where do you go to find a good sewing machine repair man? Referral from a fabric store maybe? I love this & I’m going to make it once I get my dumb machine up & running again! I’m dying to make your reversible skirt for my daughter but nearly all of the images on this page are missing (and I’m a beginner). Any chance they can be uploaded again? Thanks!! It IS simple to understand. thank you. I have a question about waistbands. You’ll see im a novice seamstress by this question. :). When cutting a waistband should it be curved? For a waistband, I cut a piece my waist size plus 3″ but it’s straight. The waist is curved and patterns are usually curved at the waist, so??? One more question…why is the bottom curved? Is it just this particular skirt pattern that is curved? I am swaybacked and usually need 2″ more in the back.